The leg is commonly imaged as an extension of an examination from the adjacent joints when symptoms or pathology extend proximally or distally. The leg, which extends between the knee and ankle joints, is highly suited to ultrasound evaluation given the superficial nature of its structures. Ultrasound has the advantage over other imaging modalities in that it can localize the site of symptoms and then trace the pathology proximally or distally in real time as required. Magnetic resonance imaging (MRI), for example, may require changing the imaging field of view and coils. In addition, ultrasound will allow a dynamic assessment, e.g., in the evaluation of an intermittent muscle hernia or tendon subluxation. Ultrasound, however, can be limited as resolution decreases with depth, whereas MRI will provide excellent imaging of deeper structures, e.g., the deep posterior compartment. 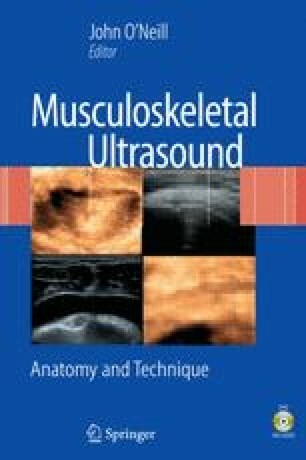 Although ultrasound and MRI are often viewed as competing imaging modalities, they are more often complementary in a musculoskeletal imaging center.